Perhaps best known for the hair style craze they created by bringing "the fade" to national prominence, Kid 'N Play were Christopher "Kid" Reid and Chris "Play" Martin. 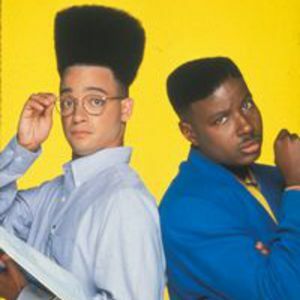 Kid 'N Play had three albums between 1988 and 1993 featuring pop-friendly sounds and positive upbeat lyrics. Hitting number 1 on the Billboard rap singles chart and the R&B Singles chart they traded on thier musical success to transition to acting starting in the early 90's with a series of 3 "House Party" films that introduced Martin Lawrence and Tisha Campbell to the world. They even had an cartoon on NBC and a short-lived Marvel comic.